The start of every new year heralds new home design trends, and 2019 is no exception. 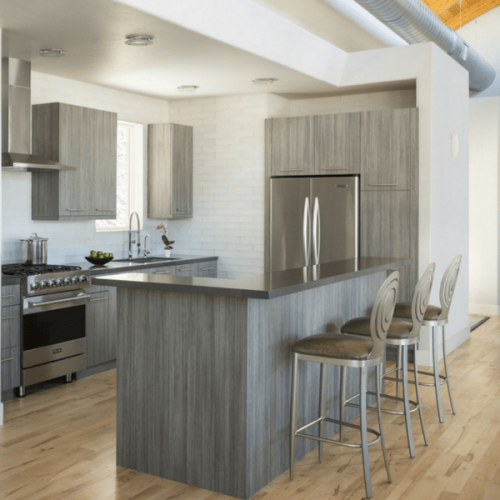 When it comes to kitchens, the general theme going into 2019 is modern innovation, meaning innovative uses of existing designs, colors, and materials, as well as having a kitchen that does some work for you. Here are 10 of the biggest kitchen design trends right now! A big part of the current kitchen trend is to showcase certain kitchen items (dinnerware, serving bowls, etc.) with open shelving, while providing hidden options to store other kitchen items (countertop appliances, flatware, etc.). This trend means a shift in traditional kitchen design, which considered upper cabinets a necessity. Two-toned cabinets were fairly popular in 2018, but going into 2019, pushing cabinets colors even further is normal. Rather than sticking to wood-tones and white, a lot more pastel colors, or even bold colors are coming into play. Hunter Green and dark blue in particular are becoming popular as a cabinet colors, as they pairs well with a number of colors and materials. A longstanding, trending design feature continues into 2019, as dark metallic faucets, cabinet pulls, and other hardware remain popular. They provide more texture and depth than stainless, without having the harshness of a matte black. This is one of the most unique counter options available today. It involves using distinct woods that have significant grain and pockets, like olive wood, and then create a form to fill the rest of the countertop with clear or colored resin. It can be as durable as granite, but its appearance is beyond compare. When it comes to finishing materials in or around the kitchen, using raw materials is trendy. Stone and shiplap are especially popular for walls. Fitting this trending feature into the kitchen involves planning to ensure cabinets and other built-in features pair. A throwback to mid-century modern design, pendants and other hanging lights are on trend in 2019. However, many of the popular options today are open lighting, like oversized Edison bulbs or large LEDs with unique, wooden designs wrapped around them. 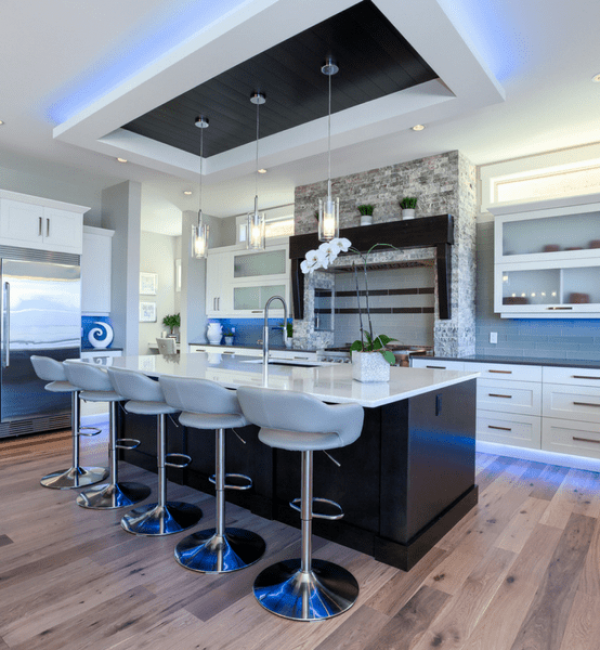 Technology continues to become more and more a part of everyday life, and connecting your kitchen with your other devices is big this year. Wifi-enabled ovens, digital wine and beer taps, and even refrigerators with built-in televisions are popular choices. These can even be taken further, as many come in integrated forms (induction cooktops, slim hood vents, etc.). The height of a backsplash has become more and more variable as time has gone by. Currently, taller backsplashes are the most popular, even full-height (either to the base of the upper cabinets or to ceiling height). When it comes to high-end homes today, full slabs of granite or marble are also becoming common backsplash options. One of the most popular interior design trends going into this year is to start with dark colors on the floor, and lighten the colors as you move up the walls and to the ceiling. Kitchen design in 2019 are taking this to heart, with dark floors and two-tone cabinets. Greys in particular are common, with an almost ebony floor, dark grey lowers, and light grey uppers, with very light to white walls. In the past few years, farmhouse kitchens have become more and more common. For 2019 though, keep the farmhouse size, but move back to undermount. Deep, single-basin, metal sinks are trending, especially in copper, gunmetal, and matte black.